Today is Sunday. Today: Keep looking forward. 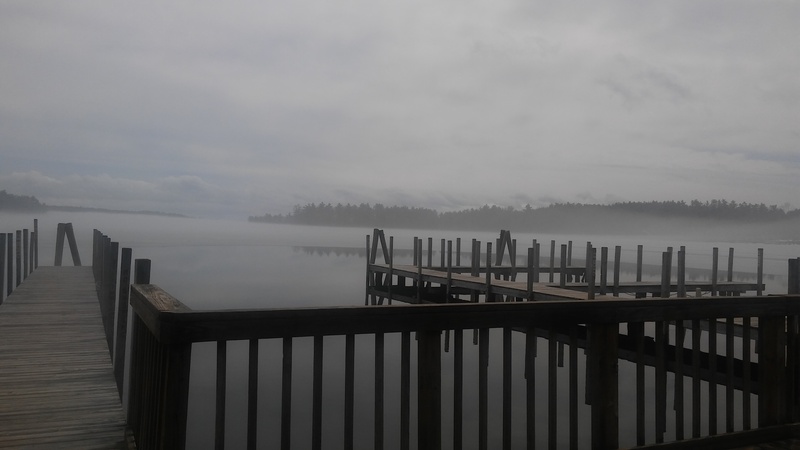 This is a picture from the pier off the northwest side of Lake Winnipesaukee in a little town called Center Harbor. The fog was lifting and the clouds were pulling back their edges to reveal a lovely blue sky. Within minutes, the sun shone and everything was bathed in a golden light. Even when things look so bad, there is still hope. Hold on good people, just hold on. Today is Saturday. Today, I saw confirmation for something many of us have known for a long time. Watch the video. This man is being punished for revealing truth. Because, if it wasn’t true no one would give a hill of beans. This affects a billion dollar industry using crap science and ruining peoples lives. The more informed we are the better to combat the lies. Today is Friday. Today is my art day. I have chosen not to work on Fridays to complete art projects and catch up with my caged peeps. This past week, I sent stamps, funds and a guitar to prisoners. I fed 3 homeless people and I cleaned a house for an elderly lady who has had a number of strokes. I am not sharing this because I’m looking for a pat on the back or a medal. I was a bit taken aback by some comments that were made after I posted that I missed my son. I work most days on my knees in front of toilets and scrubbing bathtubs. Some people are kind, others are not around, and some are pretty damn condescending. But, it’s worth it when my son has money to call and a few of my caged sweet peeps get something good to eat and stamps for letters to their lawyers. I am far from perfect; but, I do try to make love an action. I still miss my son. Today is Thursday. Today, my son called me early to tell me that he loved me and to not be upset. Well, you know, that went through me like a hot knife. I was driving when I took his call. Imagine living in a country that destroys people and other countries just to push it’s agenda of voracious greed and power. Tonight, I lift up a mother, a journalist and son as they face tremendous persecution. Tonight, I will continue to be on my knees. Truth; it is a dangerous business. Today is Wednesday. Today, Matt called and talked for more than his recently and usual 3 minutes. He got his minutes renewed..;) We covered alot of topics in the 15 minutes. It felt like a sitting down to a fabulous buffet. Today is Tuesday. Today, I was stunned by Supreme Court Justice Gorsuch response to a plea regarding a prisoner on death row. This prisoner has a disease that would cause him to choke and gag on his own blood because of tumours in his throat if given the controversial legal injection. What a merciless, soulless monster. May the mercy he shows others never become the level of mercy he is shown even though he deserves the same. Today is Monday. Today, it actually snowed again. Okay, it ain’t pretty no more. I want my 55-60 degree weather and flowers. Today, I chatted with one of my young co workers who is struggling to find a place to live. She informed me that my generation screwed things up for her. I have to agree with her. What have we left for younger people but a planet in peril, pathetic paying jobs, lack of affordable housing and a sense of entitlement. She is the 4th young person in a few months who can’t find a place to live. One of my previous co workers lived out of her car. I can only imagine how difficult and almost if not impossible for someone coming out of prison to find a job and a place to live. What’s wrong with us? That’s a rhetorical question people. The real America. I’m working on ideas how to help.